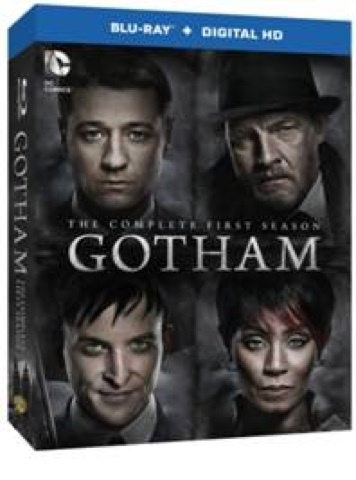 GenreOnline.net: GOTHAM: THE COMPLETE FIRST SEASON Available on Blu-ray and DVD September 8, 2015. GOTHAM: THE COMPLETE FIRST SEASON Available on Blu-ray and DVD September 8, 2015. BURBANK, CA (June 4, 2015) – With an average of 9.6 million viewers per week, Gotham has captured and held the attention of audiences since the premiere episode which delivered FOX’s highest-rated fall drama debut in 14 years with Adults 18–49. Before the series returns to FOX for a second season this fall, fans can now enjoy all 22 episodes – plus nearly 2 hours of extras including new featurettes, unaired scenes and a gag reel – when Warner Bros. Home Entertainment releases Gotham: The Complete First Seasonon September 8, 2015. This season’s #2 broadcast drama among men 18-34 will be available on Blu-rayTM and DVD for $60.10/$59.98 SRP. Gotham: The Complete First Seasonfeatures a star-studded cast including Ben McKenzie (Southland, The O.C.) as Jim Gordon, Donal Logue (Vikings, Sons of Anarchy) as Detective Harvey Bullock, David Mazouz (Touch) as the young Bruce Wayne, Sean Pertwee (Elementary, Event Horizon) as Alfred Pennyworth, Robin Lord Taylor (The Walking Dead, Another Earth) as Oswald Cobblepot/Penguin and Jada Pinkett Smith (HawthoRNe, The Matrix Revolutions) as Fish Mooney, Also starring Zabryna Guevara, Erin Richards, Camren Bicondova, Cory Michael Smith, Victoria Cartagena, Andrew Stewart-Jones and John Doman, the drama series is produced by Warner Bros. Television. Based on the characters from DC Comics, Gotham is executive produced by Bruno Heller, Danny Cannon (Nikita, CSI series) and John Stephens (Gossip Girl).